Sooke's late season fishing continues to be pretty decent -- either that or the winter fishing season has started early, depending on how you look at it. 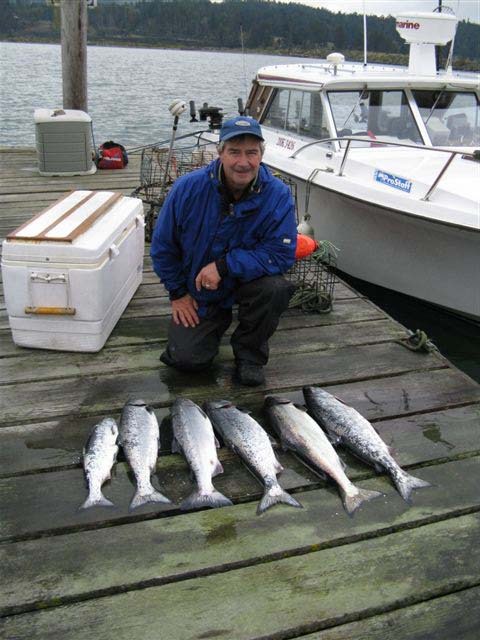 Mark Price from Footloose Charters reports six salmon caught today in just a few hours. Two were coho, one about 6 pounds, the other about 12. Four were winter springs between 10-15 pounds. Mark says "Looks like they are coming in early and they are good size". The hot spot is between the Sooke Harbour mouth and Otter Point, from the Sooke Bluffs to the Trailer Park, bouncing the bottom 130-160 feet deep. Good gear to use is a glow flasher, and any glow hootchie or jellyfish/purple haze hootchie. You have a pretty good chance of catching a winter spring salmon, which many consider to be the best table fare...nice fatty fish ready for the BBQ. And the nice thing about fishing bottom, sometimes you get a nice surprise with a halibut bycatch! There's some good size coho around too, plus the chum have arrived...which can make for some really fun fishing. 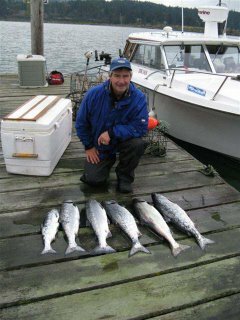 See the sportfishingbc forum for some tips on how to fish for chum. Sooke Harbour Marina is hosting a fishing derby, Oct. 31 to Nov. 9. Entry fee is $25, or $15 for juniors. Chum is the main goal, as the most sizable salmon around Sooke this time of year, but prizes are also awarded for chinook, coho, and halibut too. Proceeds go to the Sooke Salmon Enhancement Society.